Hi there, does the Photosmart B109a All-in-One model have the facility to be wireless? Thanks, Jane. 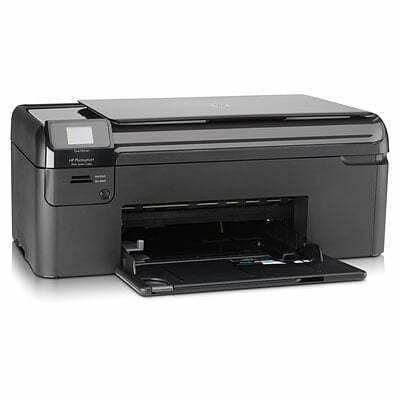 As far as we're aware, the HP Photosmart B109a All-in-One printer doesn't have built in wireless connectvity although similar models in the series do, such as the HP Photosmart B109n wireless printer. For more information about printer functions or specifications please refer to your printer manual or contact the manufacturer of your printer (HP). I'm running the Photosmart B109a printer with Windows 7. The printer was purchased in Australia and uses a HP 564 cartridge. The HP 364 which fits the printer when loaded displays a non- compatibility error message and will not print. Can I refigure the printer to take a 364 as I cannot find a UK source of 564 cartridges? All printers are given a region code that locks the machine into only being able to work with cartridges bought from the same region where the printer was purchased. This is the reason that your HP Photosmart B109a All-in-One printer is displaying the non-compatibility error message. Please call HP technical support to discuss this matter further. They may be able to help you in changing the region code on the machine so that it will accept UK cartridges. Are the HP XL cartridges for the Photosmart B109a All-In-One genuine Hewlett Packard? Thank you. We do stock both genuine HP and compatible HP 364XL ink cartridges for the HP B109a All-In-One printer. The compatible cartridges have 'Premium brand recycled ink cartridges' next to the picture, whereas the genuine HP cartridges have the HP logo and a picture of the official HP packaging. You can also identify whether or not a product is genuine by clicking on the appropriate item and reading the product description. How much is postage of HP B109a All-In-One inks to France please? Unfortunately, we only ship within the UK. I'm trying to replace the black ink cartridge for the Photosmart HP printer model B109a. The black is a larger size compared to the colour ink cartridges. Please could you tell me how I get hold of the bigger size for the black as I've tried most places and they seem to send me the original size. Is there a specification number I need etc. Help? My ink has now run out completely! What store has the biggest range of HP B109a All-In-One cartridges anywhere? The top choice is Cartridge Save, the leading supplier! Looking around to get replacement ink cartridges is a frustrating annoyance, notably when it involves needing to drop by various kinds of specialists. Then again, changing B109a All-In-One cartridges need not end up being a stressful routine. Get your HP B109a All-In-One ink now from Cartridge Save. Totally Free Next Day Delivery With All HP B109a All-In-One Inkjet Cartridges! Free overnight delivery comes as a piece of the bundle with every order when you purchase low cost HP printer cartridges from us. All HP B109a All-In-One print cartridges ordered at Cartridge Save are also covered by our money-back refund policy. When there are super offers such as ours you can really spend less thanks to Cartridge Save! Idea for household use, the Photosmart B109a All-In-One is a basic multifunction printer capable of printing, copying and scanning documents and photos. It is a reliable home printer with a budget friendly price tag, and is great for printing graphics and text documents, as well as quick scanning. The economy mode saves a lot of ink. HP has thrown in extra software for more complicated print projects. But while it's an excellent home-use printer, the Photosmart B109a All-In-One is not quite good enough for professional use; there are certainly plenty of other printers more suitable for small offices. We love the Photosmart B109a All-In-One's elegant piano black finish and compact design. The flatbed scanner is set on top of the unit and the media tray is compact. The touch screen controls are right on the upper left corner of the device, below which are the memory card slots for direct printing or storage of scanned documents. The Photosmart B109a All-In-One is good enough for printing school reports and web pages, especially on plain paper. However, it's not the best printer for images. This user-friendly machine comes bundled with extra software with templates for different print projects. The 64MB memory of the Photosmart B109a All-In-One is ample, and the high speed USB connection makes it easy to use. There's no question that HP's Photosmart B109a All-In-One is an efficient household printer, but it is not a photo printer. Expect visible streaks and occasional ink drops when printing images. Set up may take time, and wireless connectivity is not supported.